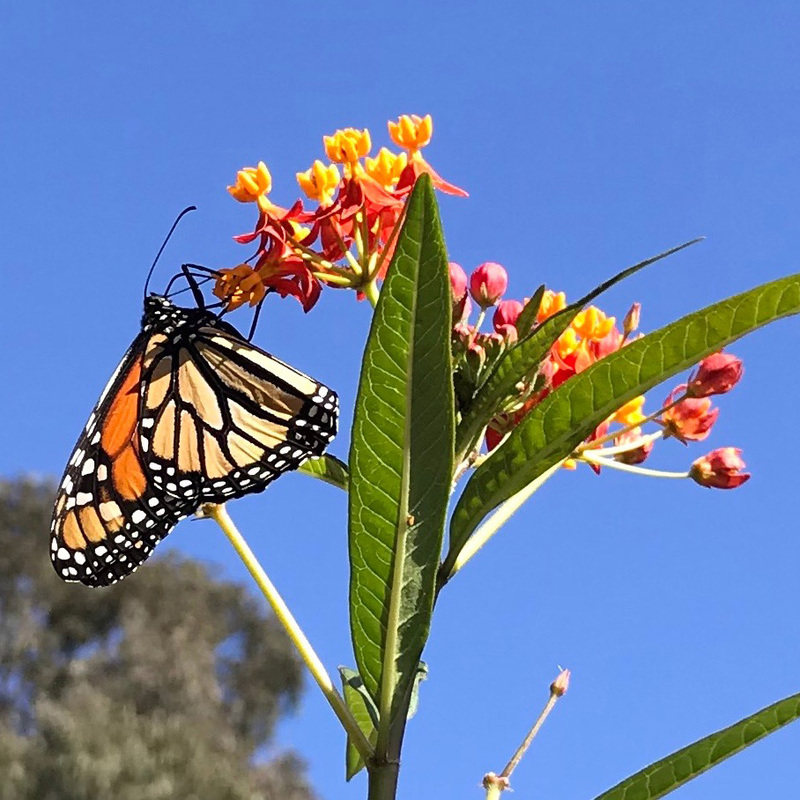 Return of the Butterflies | Kid Reporters' Notebook | Scholastic Inc.
A monarch butterfly hangs onto a beloved milkweed blossom. In Santa Cruz, California, an annual autumn celebration welcomes the return of migrating monarch butterflies. In 1998, Santa Cruz celebrated the arrival of 130,000 butterflies. This year, the city welcomed only about 13,000 monarchs to Natural Bridges State Park. Unfortunately, the use of pesticides and destruction of the butterflies’ natural habitats have played a major role in this unique insect’s decline. A big goal of the annual event is to restore the monarch’s numbers. The butterflies fly south from the Sierra Nevadas in search of a warm place near the coast. They begin to arrive in Santa Cruz in mid-October and leave by mid-February. “I saw a bunch of butterflies flying over my school, and they were all in a group by an area of trees,” says Hayley Abler, 12, a student at Bonny Doon Elementary School. “My teacher asked me if I knew what type of butterflies they were.” Luckily for this entomologist-in-training, she knew that they were monarchs. The October celebration this year began with a glimpse of the monarchs in their natural winter habitat. The visitors’ center at Natural Bridges set up educational stations, showcases local musicians, and served home-cooked food with butterfly-related names. Kids of all ages proudly showed off their butterfly creations made at the crafts tables. On the wooden path to the eucalyptus grove, people lined up to see the orange and black beauties. Along the walkway, telescopes provided a close-up view of the monarchs, which play a key role in our ecosystem. In the trees, clusters of butterflies hung on each other creating a delicate umbrella effect. The trees provide protection from the wind, as well as flowers for the butterflies to eat while roosting in the late fall and early winter. Kids work on their butterfly creations at the festival. Butterflies only live for six weeks. So every year, a new generation comes back to Natural Bridges. “It is the great-great-great-great-grandchildren that come here to Natural Bridges,” explained Susan Leo, a guide at the festival. It’s still a mystery how butterflies’ descendants know to return to the same place. At the celebration, milkweed plants and seeds were available for sale to encourage families to grow this essential plant in their own yards. Milkweed is the monarch’s companion plant and the only plant that the female will lay her eggs on. The monarch goes through a life cycle that lasts 10 weeks. It starts with the egg. Once the egg hatches on the milkweed plant, it’s called a caterpillar. After two weeks, the caterpillar is fully grown and able to find a place to attach itself to become a chrysalis. Usually, the chrysalis will attach to a stem or leaf using silk. During this 10-day phase, not much appears to be happening. But big changes are occurring inside the chrysalis, as new body parts emerge. Soon, the butterfly will blossom out of the chrysalis and enjoy the six weeks of its short life. If you plant milkweed, you will be able to witness this beauty and help the environment.